Fine art paper with a matte finish. This is the album Joel & I chose for our own wedding album. I love how elegant the cover is and that there's no glare on the pages. The pages are nice and thick so I'm not worried I will wear it out while I'm flipping through it a million times (which I will). It's an album that's meant to last for generations. A classic. I love how the images pop on the page. 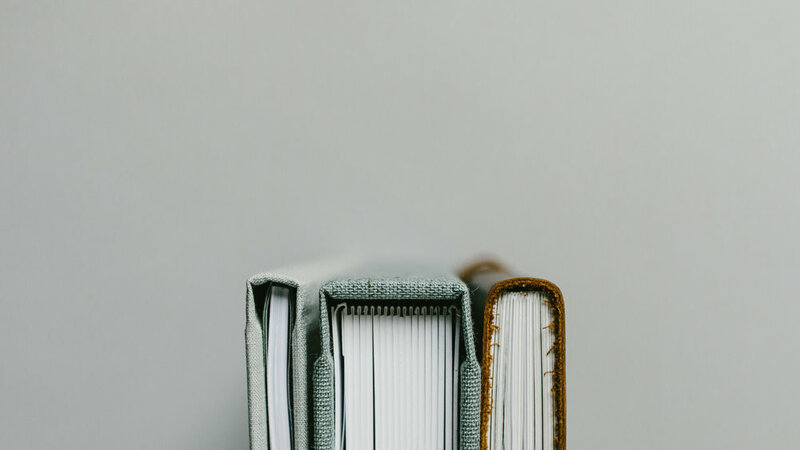 The layflat design means you don't lose any of your images in the centre of the book and the thick pages mean you can look through it over and over without worrying about tearing the pages. The texture of the cover, ability to choose a colour that suits you and add your names makes this one a favourite. You can use a regular font or choose to have your names imprinted in calligraphy. Choice of three colors of linen. The premium paper makes it more durable and higher quality than the average photobook you order online. It has been scored to have a layflat feel. With the smaller price point, it's a great option for parent albums, boudoir or family sessions. This is the album I regularly make for lots of events I want to remember and have tangibly in my hands, but don't feel the need for the extra durable paper.